• CHOLESTEROL concentrations in High-Density Lipoprotein (HDL) and Low-Density (LDL)/Very-Low-Density (VLDL) Lipoproteins are strong predictors for coronary heart disease. Functional HDL offers protection by removing cholesterol from cells and atheroma. Higher concentrations of LDL and lower concentrations of functional HDL are strongly associated with cardiovascular disease due to higher risk of atherosclerosis. The balances between high- and low-density lipoproteins are solely genetically determined, but can be changed by medications, food choices and other factors. Simple, direct and automation-ready procedures for measuring HDL and LDL/VLDL concentrations are very desirable. BioAssay Systems HDL and LDL/VLDL quantification kit is based on our improved PEG precipitation method in which HDL and LDL/VLDL are separated, and cholesterol concentrations are determined using a single Working Reagent that combines cholesterol ester hydrolysis, oxidation and color reaction in one step. The color intensity of the reaction product at 570nm or fluorescence intensity at λex/em = 530/585nm is directly proportional to total cholesterol concentration in the sample. 1. I want to ask about the differences between "EnzyChrom? AF HDL and LDL/VLDL Assay Kit and EnzyChrom? 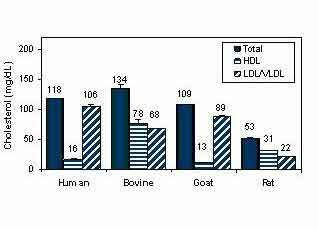 HDL and LDL/VLDL Assay Kit. Since I want to work on mice. Both kits will work with mouse serum and plasma samples, but I would recommend using serum, because we have not validated the use of plasma. The EHDL-100 kit has a linear detection range of 5 -300 mg/dL. It requires a microplate reader with a 340nm filter. The E2HL-100 kit is more sensitive with a linear detection range of 1 -100 mg/dL using the colorimetric readout (requires a 570 nm filter), or 0.2 -10 mg/dL with the fluorimetric readout (requires a fluorescence microplate reader).